One movement work. 6 pages, 8.5" x 11". by Jenni Olson, bass flute and Marcia Dickstein, harp. 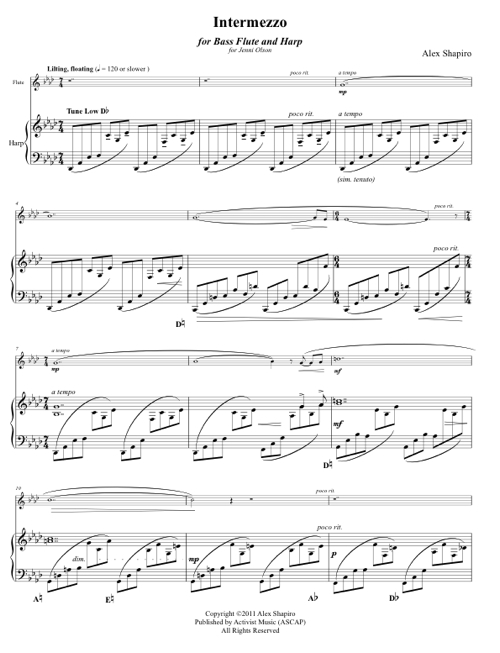 Score available for $15.00 print, $10.00 digital, from Activist Music. Intermezzo was written as a response to the waves of the ocean, as well as a reflection of the waves of a more introspective, emotional sea. A long and lyrical theme floats above a steady ostinato, perhaps as a lengthy branch of kelp might dance from the force of each coming tide. The version of Intermezzo for bass flute and harp is featured on Jenni Olson's 2012 CD, The Dreams of Birds, on Delos Records DE3434. Click CD for more info. by Jamie Rainville, clarinet and Rebecca Ahlfors, piano. by Doug Davis, cello and Rowena Hammill, piano. One movement work. 5 pages, 8.5" x 11".